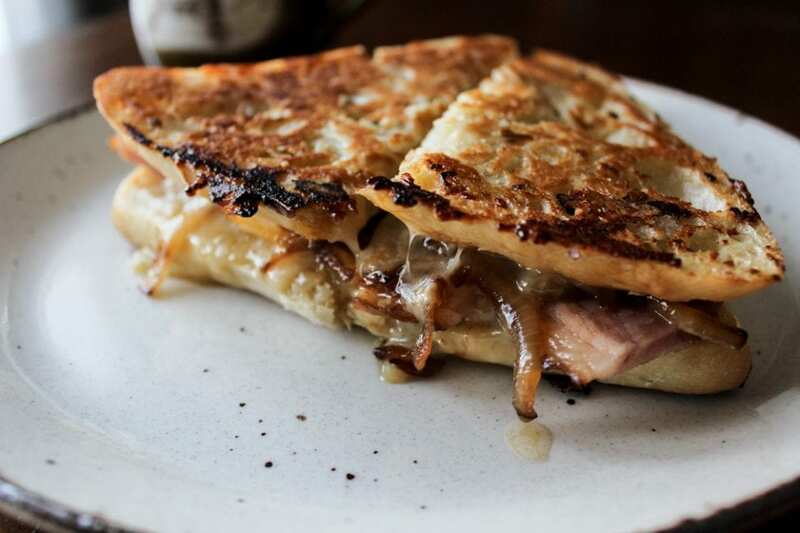 Classic monte cristo recipe with caramelized onion, drizzled with maple syrup and toasted with garlic butter! Cheesy, crispy with a touch of sweetness! Yep, still working on that ham from a few days ago. Do you think the salt in that thing can preserve my insides? I’d say yes but hey you only live once right? Days when you’re behind in errands are sandwich kind days here. (Quick and lazy meals for the win!). 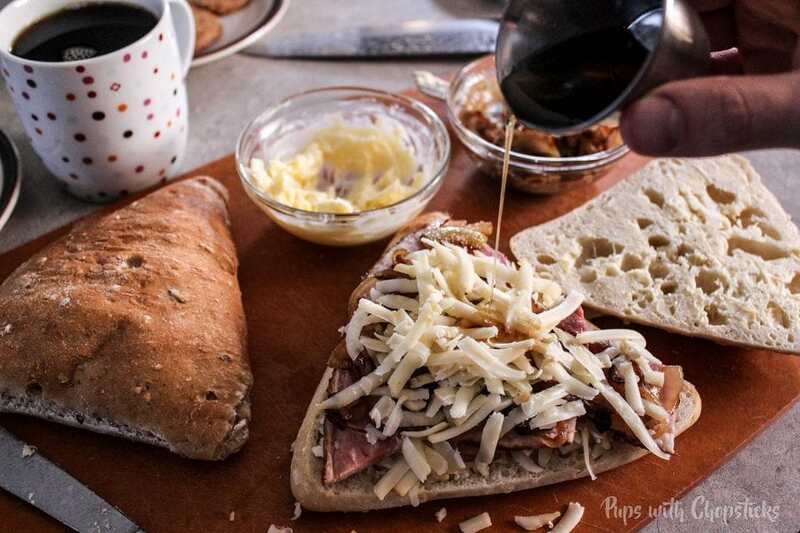 Although this sandwich had a bit more steps than a quick slap together sandwich, but it was the weekend so we could spare an extra few mins for that melty gooey cheesy goodness. 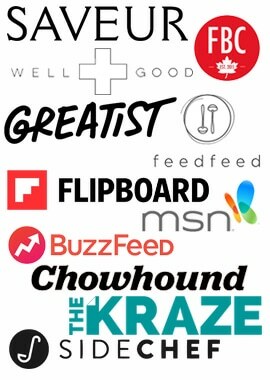 While I was putting this together, I had a craving for something maple so I apologize that there is no maple syrup in my ingredients image below. It was something I thought of after I took that picture. The sweetness from the maple syrup pulls the flavours all together in an all rounded complete flavour — smokey, salty, cheesy, with a touch of sweetness. Seriously. This is good stuff. 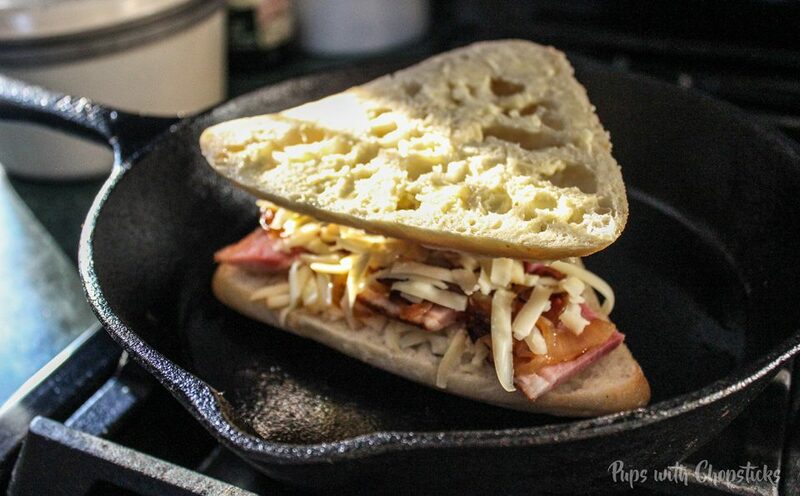 Especially if some of the maple runs off the sandwich and gets a little caramelized with the bread. The shape of the bun doesn’t really have an optimal surface area for a pan to bread browning for proper crisping so I flipped the top half of the bun upside down! 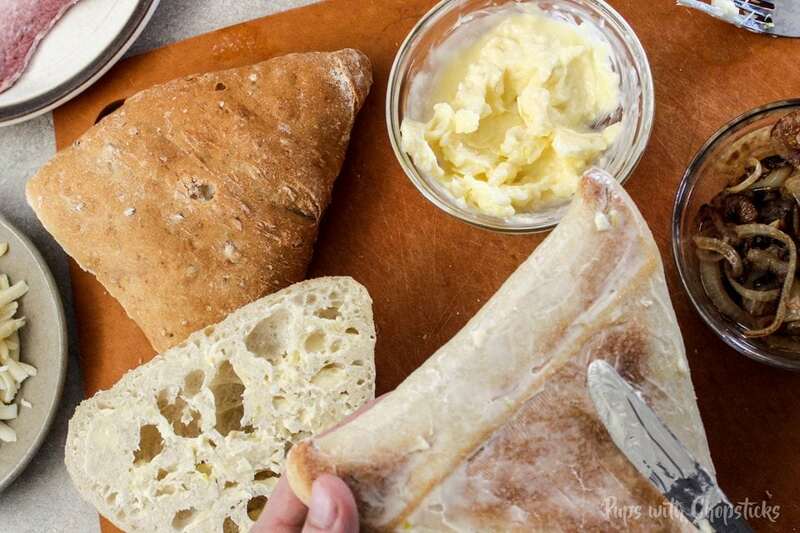 The more bread touching the pan, the more crispy garlicky buttery goodness! Traditionally Monte Cristo’s uses egg for an almost french toasty layer but I wanted something a tad bit more crispy so I omitted the egg and replaced it with garlic butter. Oh yes! I put garlic in the butter, because garlic makes everything better 🙂 I found that when you mix the garlic in a slightly warm butter, it takes that raw garlic bite out of it. So I heated the butter in the microwave slightly (on low heat for about 20 seconds) and threw in some chopped garlic. Note: While spreading butter on the outside of the buns, make sure you don’t include any of the garlic bits. The garlic will burn, which would make it taste bitter and not very tasty. Don’t worry about not being garlicky enough! 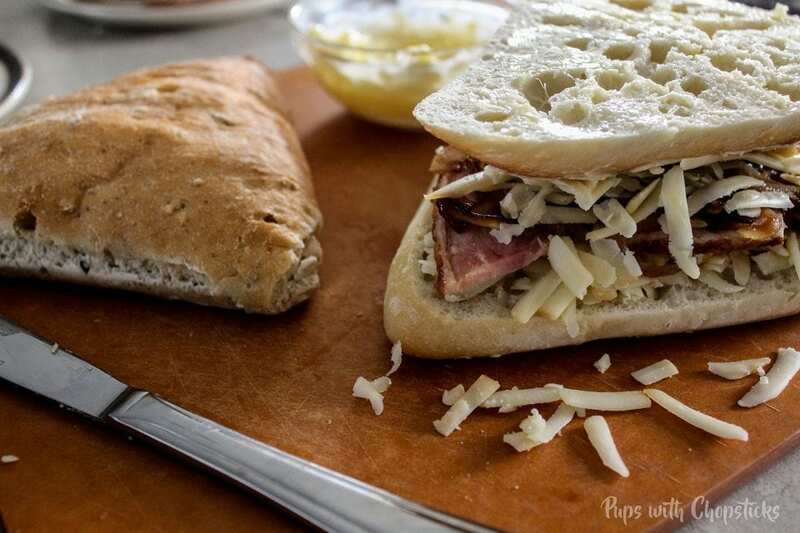 The inside of the sandwich will have the garlic, and — the butter has been infused with the garlic flavour as well! 🙂 Win win! Let’s talk cheese. Lately, it seems that everyone’s been oohing and ahhing about the fancy cheeses. There’s no doubt the popularity of these fancy cheeses are on the rise. My local supermarket (nothing fancy) is starting to serve up hundred’s of variety of different types of fancy shmancy cheeses as well. But let’s be honest here, cheese is cheese and all cheese fancy or not is good. 🙂 I opted to use smoked cheese only because I had it on hand (good ol’ Costco again), but you can use any type of cheese and the sandwich will turn out just as delicious. After you assemble this tower of deliciousness, drizzle some maple syrup and heat it up in the pan to crisp it up and enjoy it while it’s hot and gooey! 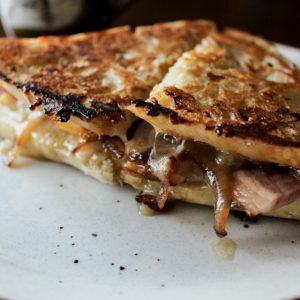 Classic monte cristo recipe with caramelized onion, drizzled with maple syrup and toasted with garlic butter instead of an egg! Cheesy, crispy with a touch of sweetness! Mix the chopped garlic into slightly warm butter. This cooks the garlic slightly and takes out the sharp garlic bite. 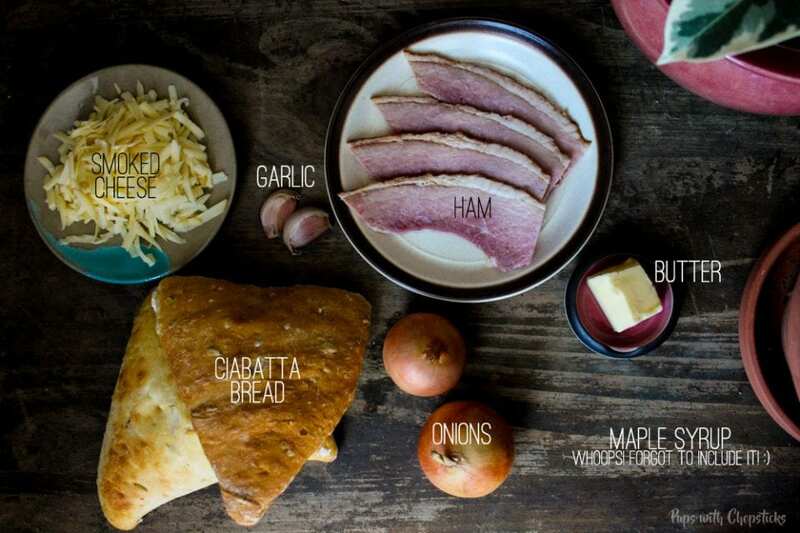 Switch up the breads and cheeses and have fun with this! That sandwich looks absolutely amazing. 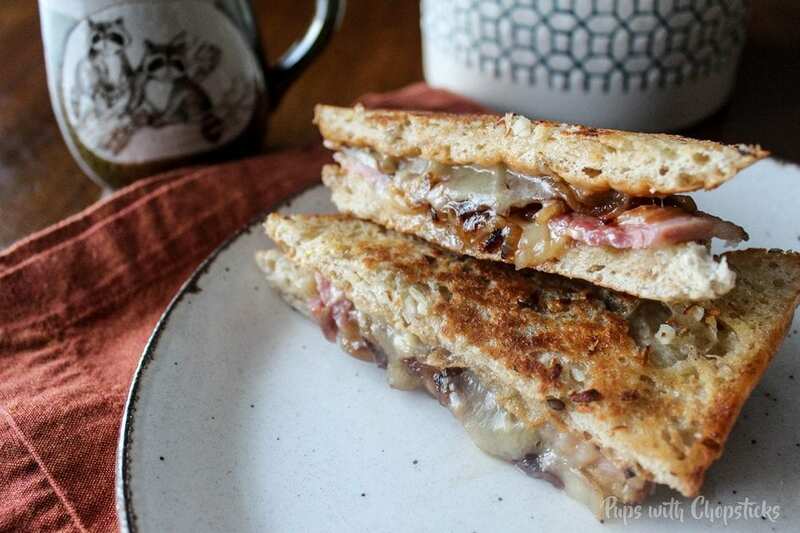 I love the idea of the sweet of the maple syrup and caramelized onions against the salt of the ham and cheese.